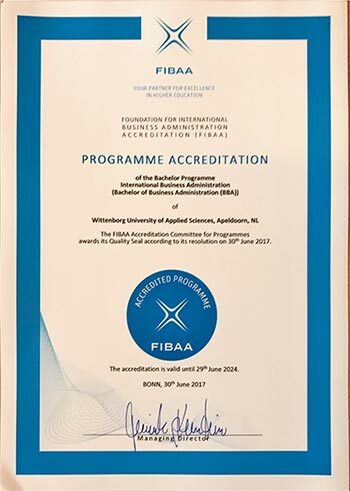 All Wittenborg University of Applied Sciences’ IBA specializations has just been re-accredited for the next 7 years by the German, Austrian, Swiss Accrediting body (FIBAA) following a rigorous assessment process earlier this year. That means that accreditation of its IBA programmes is valid from 30 June 2017 until 29 June 2024. 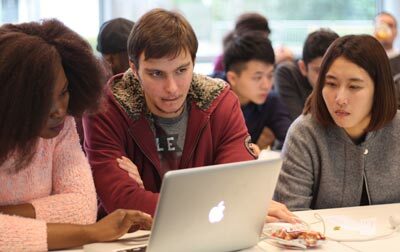 The international composition of its staff and student body was described as “remarkable” by the assessment panel. “We are ecstatic,” Wittenborg’s chair of the executive board, Peter Birdsall, said in reaction to the news which he announced at the university’s recent Summer Graduation Ceremony. Wittenborg is also expected to get the same stamp of approval from the Dutch-Flemish Accreditation Organisation (NVAO) – hopefully in autumn, Birdsall said. In addition, Wittenborg was audited for an award entitled the Certificate for Quality in Internationalisation by the European Consortium for Accreditation (ECA) - an association of recognized accreditation and quality assurance agencies in Europe. The FIBAA assessment document was clear in its praise of Wittenborg's internationalisation strategy, and the award will be applied for together with the NVAO accreditation later this year. The IBA programme was first accredited by NVAO in 2006 and then again in 2012 by both NVAO and FIBAA. “We don’t take the positive accreditation for granted and see the approval as part of an ongoing exercise in quality improvement,” Birdsall said. • The integration of theory and practice. • The practical business experience of its faculty. • Student support by the faculty. • International content and intercultural aspect. • Internationality of the student body. According to the panel the promotion of employability runs as a common thread of the study programme through all its modules. “The project weeks in Phase 1 and 2 manage to link in a very good way the theoretical content with projects and practical experience. The work experience the students gain during their work placement in Phase 3 helps to further apply the collected knowledge into a practical environment. The panel also commended Wittenborg for the changes it made since the last accreditation process, commenting that it led to a positive development of the IBA programme which can also be seen in the growth in student numbers and an increase in staff. This includes an update and improvement of the Graduation and Examination regulations which also underwent an audit by the ministry of education, student involvement in the development of programmes and discussions with graduates about their careers. “WUAS has invested in a new software system that will make connecting students and graduates in an online portal, specifically designed for Alumni.